What are Causes of Elbow Pain? Elbow pain and dysfunction is often a result of improper motion dynamics at the scapulothoracic joint (shoulder blade). The shoulder blade is attached to the body by a single joint; however there are seventeen different muscles that create, maintain, and hold your arm through different movement patterns and positions. If improper motion occurs at the shoulder, then altered myofascial tension is created. This places strain on the elbow which eventually leads to pain. What are Symptoms of Elbow Pain? 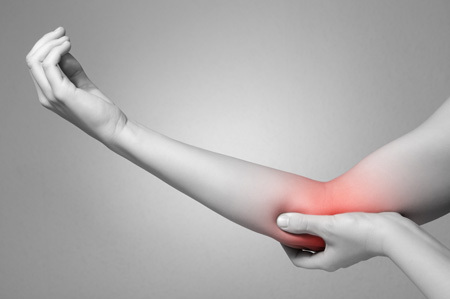 Symptoms of elbow pain usually occur at two specific locations: medial and lateral elbow. Symptoms may include: sharp, shooting pain down the arm and/or weakness of the hand with specific movements. At ICT Muscle & Joint Clinic, we focus on treating the symptoms and root cause of your pain. The body is a dynamic, mobile structure and must be assessed and treated as such to create successful long-term outcomes. We employ the best scientific, evidence-based, treatment procedures using a combination of chiropractic manipulation, soft tissue therapy, and rehabilitative exercises. Surrounding all joints, there must be a balance between tension and compression of the ligaments, muscles, tendons, and fascia. When pain is present, it is due to an imbalance of these structures requiring mobilization and release of tight structures, in addition to strengthening weak or inhibited structures of the painful joint(s) as well as the joint(s) above and the joint(s) below. Elbow pain and dysfunction is often the consequence of improper neuromuscular dynamics that occur at the hand, wrist and scapulothoracic junction. Our doctors focus on a comprehensive approach, geared toward lasting results.